GTX56233 is currently not offered. Specificity/Sensitivity: Epitope specificity group B (ISOBM classification) similar to M-11. 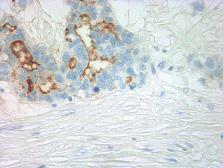 Specificity/Sensitivity: Reacts specifically with CA 125 ovarian cancer antigen. Specificity/Sensitivity: Epitope specificity group A (ISOBM classification) similar to OC125. Specificity/Sensitivity: Specific to group A.